Nowhere else on the planet you will find together the intoxicating blue of the Aegean, embracing the sparkling white of the houses, the fragrance of the dry earth mingling with the fresh smell of seaweed, the roundness of the pebbles on the beaches and that incredible clear light with its rays penetrating deeply into the boundless blue! 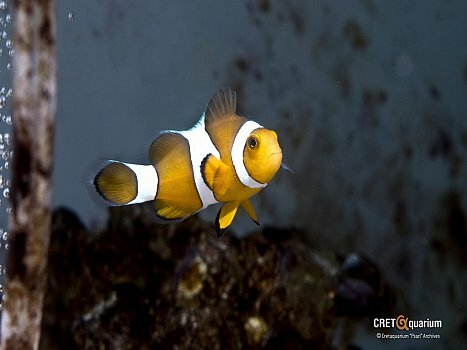 Even the fish are unique in their colors or the way they react! Although many people consider as top diving destinations the Carribean or the Red Sea, the Mediterranean underwater landscape has much to offer to the human eye. The Mediterranean Sea gives life to 650 species of fish, to seals, dolphins and thousand of invertebrates, while special mention should be made of the well-known sea grass Posidonia, which replenishe the oxygen in its waters. 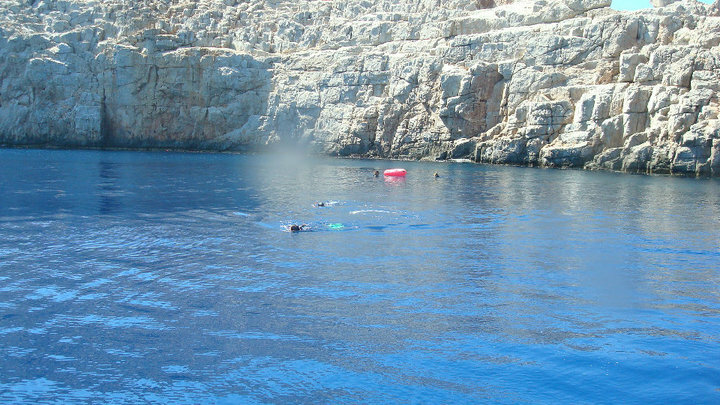 In Crete you will find many organized and experienced diving centers right on the beach, offering multiple diving courses and activities for people of all ages, in order to explore the beauty of the Mediterranean. Scuba diving is for everyone, even for children of 12 years or more, allowing you to enjoy this activity with your family and friends. Have you taken the big decision but your stresses do not help you to organize and to prepare your wedding; WddingFlowers is here for you. Through these pages you will find that you looking for: organisation, basic information and useful advices about wedding. Wedding FlowersÂ is the only Greek site, who is dedicated in wedding and in flowers. You will be informed about anything concerns the wedding and you will find useful information’s and best proposals, which are make your wedding organisation separate. If you are a professional florist, take this unique occasion and you will be meet the best collaborators of your sector. From these pages of our site, you will have the chance to inform about the new materials and the tendencies and you can select prototypes products that they will facilitate and renew your work. The HCMR Greek Aquarium is situated in the place now called Thalassocosmos, site of the HCMR marine science and aquaculture institutes, a meeting point where science, discovery and recreation are equally accessible. The aquarium has therefore been designed to serve the needs of a wide range of visitors and user groups. Inside the aquarium, there is a designated visitor capacity of 300. The aquarium will be open every single day of the year, including public and religious holidays. Since the opening of the aquarium in December 2005, there have been more than 100,000 visitors. Up to four thousand marine organisms will be introduced into the aquarium where they will spend their lives within specially designed and constructed tanks containing 1.6 million litres of seawater, and visible to the public through 300 m2 of glass or transparent acrylic materials. Overall the building covers 5000 m2, including the backstage and technical support areas. At both the entrance and exit of the aquarium there is a coffee shop and a central meeting point. Some very small organisms, such as phytoplankton, zooplankton, eggs, larvae, will be visible by means of gigantic screens that the visitor will be able to manipulate without difficulty. 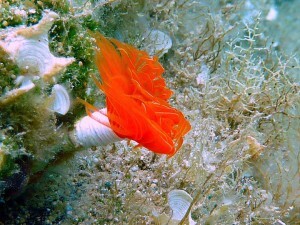 Thus, visitors will be introduced in a dynamic way, following the route designed for them, to the leading roles in the marine environment played by Science, Technique, Marine organisms and last but by no means least, Humankind itself. 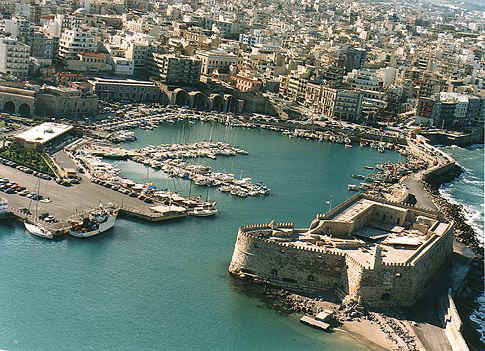 HeraklionÂ is the biggest city in Crete (and fifth in Greece) with a population in excess of 120000. It concentrates most of the economical activity of the island, and is the main port of entry to Crete for the majority of visitors. The Heraklion airport receives approximately 15% of the total tourist traffic of Greece. The Heraklion airport (HER), named after the Cretan writer Nikos Kazantzakis, is one of the biggest in Greece. There are many airlines currently operating flights from Athens and Thessaloniki to Heraklion, Olympic Airways, Aegean Airlines, Cronus and others while during the high season there are flights from/to Rhodes, Mykonos and Santorini. There is also an international airline,Transavia, that connects Heraklion to Amsterdam , Holland. Transavia has two flights per week , during the winter season, with more of these during the tourist period. During the summer season there are numerous chartered flights to Heraklion from all over Europe (mainly Germany, the United Kingdom , and Holland). During the summer months there is a huge increase in air traffic that peaks in August (approximately 130 flights per day). Heraklion’s airport is about 5km east of the city. Major car-rental companies have desks at the airport. Taxi and public bus are available for trenfer to Heraklion. Several myths have been created during centuries concerning Crete. They used to represent the way people think and how they tried to explain strange phenomena and events. Below the most well-known myths are presented. After Kronos and the other Titans had overthrown their father, Ouranos, they inherited rule of the cosmos. Kronos was much like his father in that he had a very violent side; when he took his sister Rhea as his wife, it was foretold that one of his children would rise up against him and overthrow him, like he had his father. He resorted to a more permanent solution than Ouranos upon hearing this; he swallowed them. After he had disposed of five children this way, Rhea was absolutely desperate to save her last child. Seeking help from her mother, she devised a plan. When the time came for her to give birth, she fled to Mount Dicte on the fertile island of Crete; then, instead of giving Kronos Zeus, she swaddled a rock in thick blankets and presented it to him; he promptly shoved it down his throat. About a year later, Kronos finally vomited the children he thought he had permanently disposed of. They joined with Zeus, who had grown up healthy and strong away from his cannibalistic father on the island of Crete. Together they overthrew their father and took over rule over the world. Zeus won control over the skies, his brother Poseidon ruled over the oceans, and Hades ruled over the underworld. Before Minos became king, he asked the Greek god Poseidon to assure him that he was to receive the throne. Poseidon sent a white bull on condition Minos would sacrifice the bull back to the god. Indeed, a bull of unmatched beauty came out of the sea. King Minos, after seeing it, found it so beautiful that he instead sacrificed another bull. Poseidon was very angry when he realized what had been done so he caused Minos’s wife, Pasiphae, to be overcome with a fit of madness in which she fell in love with the bull. Pasiphae went to Daedalus for assistance, and Daedalus devised a way for her to satisfy her passions. 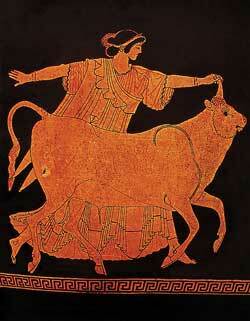 He constructed a hollow wooden cow covered with cowhide for Pasiphae to hide in and allow the bull to mount her. The result of this union was the Minotaur. 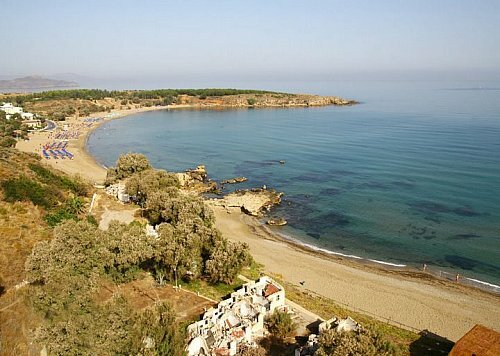 Crete is an island that is a part of Greece. The traditional folk music of Crete is called ÎºÏÎ·Ï„Î¹ÎºÎ¬. The lyra is the dominant folk instrument on the island it is a three-stringed fiddle similar to the Pontian kemenche. It is often accompanied by the Cretan lute (laouto), which is similar to both an oud and a mandolin. Thanassis Skordalos and Kostas Moundakis are the most renowned players of the lyra. The earliest documented music on Crete comes from ancient Greece. For many centuries, Cretan music was primarily influenced by eastern techniques and styles. The Cretan lyre is almost the same as the lyre of Constantinople. Concerning their roots, we have to deal with two different possible versions: 1) The lyre was brought by the Arabs who where coming from Spain and stayed in Crete as conquerors from 823 A.D. to 961 A.D.. During these years the lyre stayed in Crete continuously this means that the Arabic rebab of that period is morphologically the same as the lyre of Byzantium. 2)The lyre â€˜arrivedâ€™ in Crete from Constantinople, probably through the Dodecanese, and “entered” the island through Sitia, which is the neighbour of Kasos and Karpathos. This must have finished by the 12th century (1101 â€“ 1200 A.D.), since two centuries are more than enough for a musical â€˜tripâ€™ from Constantinople to Crete. Following the Crusades, however, the Franks, Venetians and Genoese dominated the island and introduced new instruments and genres. By the end of the 14th century, a poetic form called mantinada became popular it was a rhyming couplet of fifteen syllables. The introduction of the violin by the end of 17th century was especially important. Some of the earliest popular music stars from Crete were Andreas Rodinos, Yiannis Bernidakis (Baxevanis), Stelios Koutsourelis, Stelios Foustalieris, Efstratios Kalogeridis, Kostas Papadakis, Michalis Kounelis, Kostas Mountakis and Thanassis Skordalos. Later, in the 1960s, musicians like Nikos Xylouris and Yiannis Markopoulos combined Cretan folk music with classical techniques. For the above choices, Nikos Xylouris received the criticism of conservative fans of the Cretan music but he remained popular, as did similarly-styled performers like Charalambos Garganourakis and Vasilis Skoulas. People compose music, but when this music becomes particular to a remote geographical location, particularly when such location is historically significant, owing to the actions of its inhabitants through the centuries, then the human factor merges with the location itself.Â This is the case with the island of Crete. Cretan music encapsulates a code of daily action that befits those brave in spirit and bold in action. It reverberates the harsh and jagged rocky spine of the island, the fresh and free air of the mountains, valleys and gorges. In short, it is a reflection of the Cretan soul that roams free and accepts no limits. What kind of Chania hotels are you looking for? – Do you want Chania hotels next to dazzling beaches? – Do you prefer staying in Chania hotels near the impressive archaeological and historical sites? 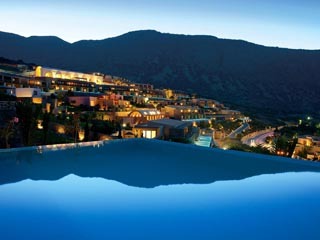 – Are you interested in finding romantic honeymoon suites in luxurious Chania hotels? – Would you like Chania hotels in serene, traditional villages? – Are you looking for Chania hotels in popular tourist resorts? – Have you planned a holiday with your kids and require family hotels in Chania Crete? – Are you searching for luxury Chania hotels or budget Chania hotels? – Have you been considering alternative vacations and need to find ecotourism hotels in Chania Crete? We can help you find the best Chania hotels to suit your needs. Reserving accommodation in Chania Crete is a piece of cake. As it is a very popular holiday destination, there is a plethora of Chania hotels scattered throughout the prefecture. Just click on the names of the hotels in Chania Crete that are listed below, and you can reserve you accommodation quickly and easily. Most Chania hotels are very charming, built in the traditional style of Crete. Visitors have an extremely wide variety of accommodation to choose from, such as Chania hotel apartments and studios, which are ideal for families and large groups. Rental villas are the best alternative to Chania hotels if a group is larger than 4 persons. Chania hotel rooms and suites are perfect for couples and small groups. Elounda is the most famous cosmopolitan location not only in the island of Crete but also in the entire Aegean Sea much acclaimed for its outstanding establishments in a magnificent natural enviroment. For these reasons, its fine hotels, listed below, proudly belong to the exclusive category of the Luxury EloundaÂ Hotels of the World. Elounda Beach â€“ Elounda Bay Hotel â€“ Porto Elounda De Luxe Hotel â€“ Elounda Mare Hotel â€“ The Peninsula All Suite Hotel â€“ Elounda Gulf Villas & Suites â€“ Blue Palace Hotel – Pleiades Luxurious Villas – these fine hotels contstitute a luxurious mosaic, which has been repeatedly chosen by world statesmen, prime ministers, members of royal families and national as well as international celebrities of stage and screen! The lagoon of Elounda is shaped between the coast and a small peninsula of 7-8 km length that serves as a breakwater. Today, the peninsula is separated from the mainland by a channel that was dug by the French at the end of the 19th century. A narrow bridge joins the peninsula with the mainland. The ancient city of Olous was situated in the area of Elounda. Some ruins of the city are preserved at the edge of the peninsula, but most of them are below sea level. The ancient history is visible on the seabed, magically connecting the rich past with the fascinating presence. During summer, boats leave the harbour every hour, transporting visitors to the small islet of Spinaloga giving the chance to the passengers to stroll in a deserted leper colony with its Venetian Fortress. Elounda HotelsÂ is a dream location for a luxurious relaxing holiday.